Among the lesser-known sights of the Komodo area is "Bat Island". Known locally as Pulau Kalong, the island is a small cone-shaped hill with a large mangrove forest extending to the southwest. The trees are home to thousands of fruit bats. 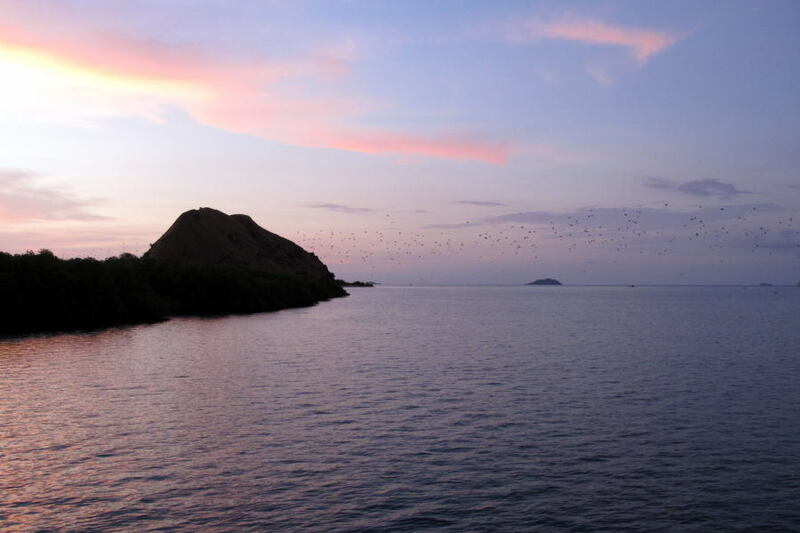 Each night around sunset, the bats leave their roosts on the island and fly off to Rinca and Flores to feed. It's a very impressive sight, especially if the weather is cooperating with a beautiful sunset as backdrop. The bats take off in search of dinner. As should be obvious, the only way to get to Bat Island is by boat, and the only time to go there is sunset. The island makes a good place to stop if coming back from seeing the dragons on Komodo or Rinca. There's a mooring buoy just off the island, and somelive-aboard boats stay the night here before heading back to Labuan Bajo in the morning.